One of my family's holiday traditions while growing up was my Mom making her delicious white chocolate Christmas mix every year during the holidays. She would fill several large canisters with this delicious concoction, and we would steal little bites every time we passed through the kitchen while rushing around during the holiday season. So this year I decided I wanted to create a recipe for a Halloween version featuring one of my favorite treats- candy corn! 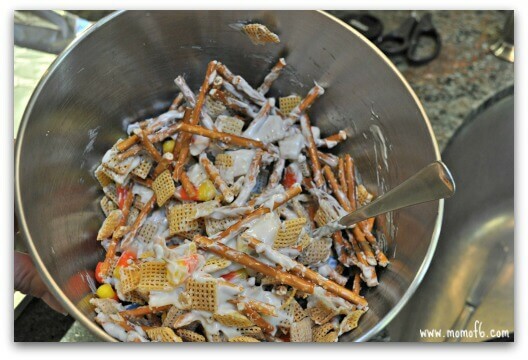 Here's how to make this yummy Halloween White Chocolate Chex Mix! This makes a rather large serving- so you might even need two bowls! Measure out your pretzel sticks, Rice and Corn Chex cereals, M&Ms and candy corn and stir all together in a large bowl. 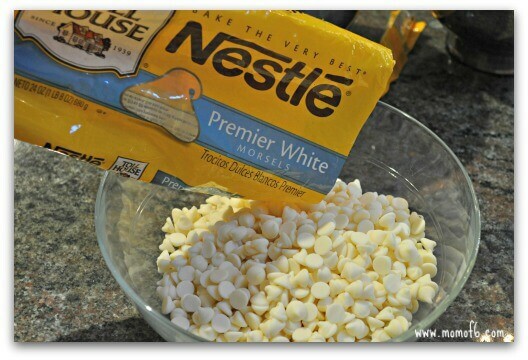 Next you want to melt your white chocolate morsels. 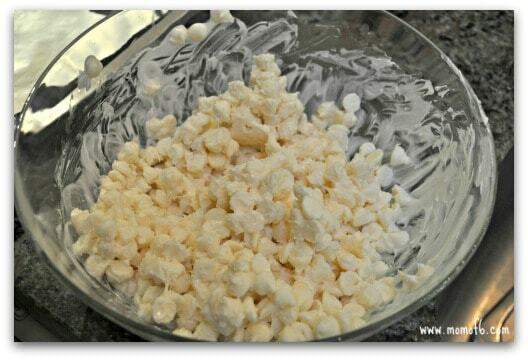 The easiest way to is to pour them into a microwave-safe bowl, and heat them on high for 1 1/2 minutes. Now when they come out, they'll look like you haven't even warmed them up. Ignore the way it looks- and give it a good stir. 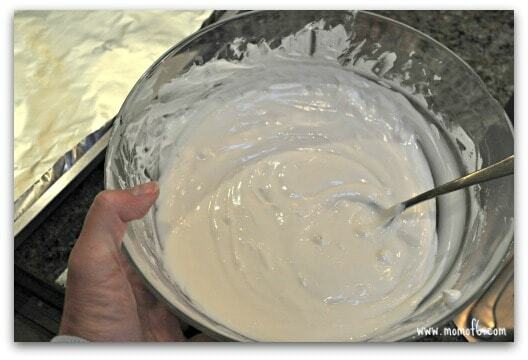 And soon it will look like this- return the bowl to the microwave and heat for another 1 to 1 1/2 minutes. Again- it won't look all melty until you start to stir. Just keep stirring until the chocolate melts and is smooth. Resist the temptation to dip in your finger. (Or try to, anyway). Pour your melted chocolate into the cereal mixture, stirring well to coat. 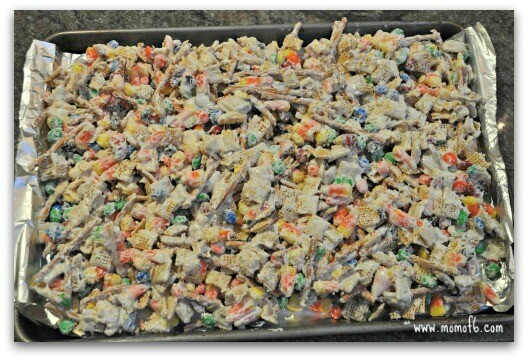 Pour your cereal mixture onto a rimmed baking sheet that has been lined in nonstick foil. Allow it to cool completely before breaking your Halloween mix into bite-size chunks. 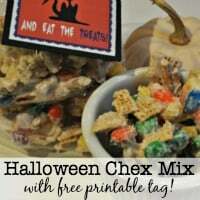 This recipe for Halloween White Chocolate Chex Mix features one of my favorite treats- candy corn! Included is a free printable gift tag you can use on your treat bags! One package of Brachs Candy Corn (warning: these are not nut-safe! The candy is made in a factory that also processes peanuts). 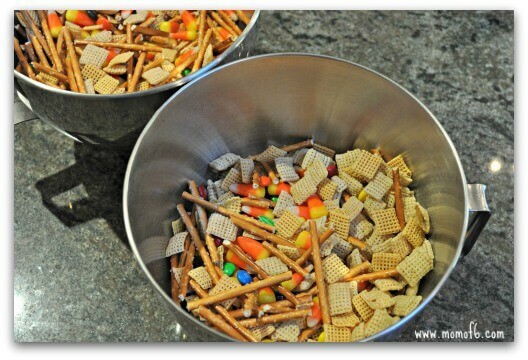 Measure out your pretzel sticks, Rice and Corn Chex cereals, M&Ms and candy corn and stir all together in a large bowl. If you find your bowls are not quite large enough to stir without spilling the contents on the counter- then place your ingredients into two bowls. 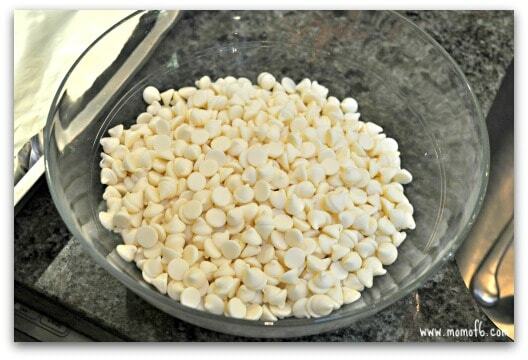 Melt your white chocolate morsels by pouring them into a microwave-safe bowl, and heat them on high for 1½ minutes. Take it out of the microwave and stir. Return the bowl to the microwave and heat for another 1 to 1½ minutes. It won’t look all melty until you start to stir. Just keep stirring until the chocolate melts and is smooth. 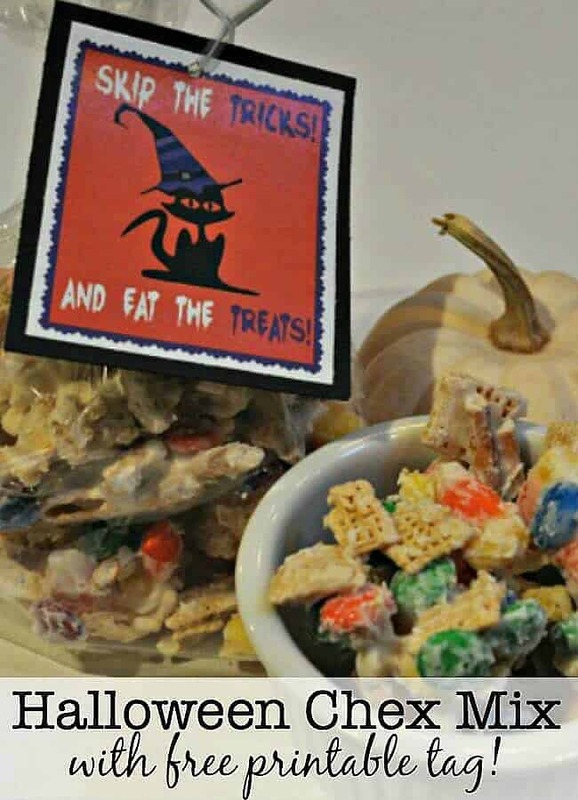 Would you like to download the Halloween White Chocolate Chex Mix treat bag tag? 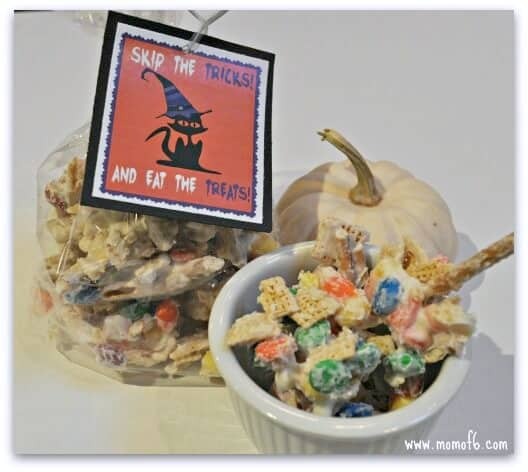 I love packaging our Halloween White Chocolate Chex Mix in little individual cellophane bags This is an affiliate link: MomOf6 earns a commission if you purchase, at no additional cost to you. and attaching this adorable black cat printable tag at the top. If you'd like to print these to use at home, simply sign up below to join the MomOf6 community and you'll be directed to a thank you page with access instructions! 20 Halloween Party Ideas for Kids! 10 Halloween Costumes for Tweens that They Will Love! 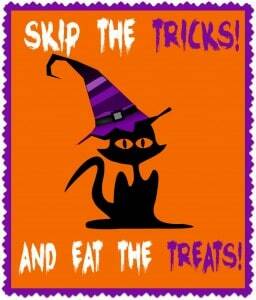 What is your favorite Halloween treat? Please share! « Organizing Ideas for a Kids Shared Bathroom!